It was a lovely sunny day here yesterday, and very warm for this time of year. As I had a day off work (the girls are on half term this week) we decided to go down to one of our local beaches for a picnic. I’ve decided to make my mother a pair of blueberry waffle socks for Mother’s day (2nd of March this year) so I took my yarn and needles, cast on, and had a very pleasant couple of hours knitting in the sunshine. It’s really nice, simple and enjoyable pattern. I should hopefully have them finished in time. Talking of presents, my sister was visiting us recently and expressed interest in the alpaca wrap. I promised it to her for her birthday and was sure I could get it finished in time, as it was about 80% finished. I picked it up to finish it last night, but noticed that I had managed to pick up an extra 10 stitches on the way, so have ended up ripping it back to nearly the beginning. It will now obviously not be finished for her birthday (in 2 days time), but hopefully she won’t mind the wait. 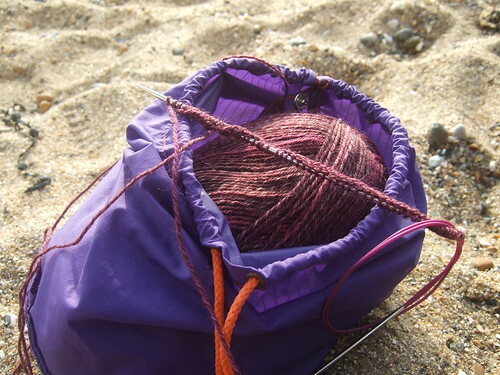 Knitting on the beach sounds delicious! I really like the yarn you’ve chosen for the socks, too. *sigh* Sounds like a perfect day! I bet your girls had a great time too.